Growing up in New York during what turned out to be the Golden Age of the American Musical, I was privileged to have seen the original casts of many of the greats, “Hello, Dolly!” among them. I first saw Carol Channing in the lead in 1964, the year the fabulous Jerry Herman show opened — and ran for 2,844 performances. I saw her two more times, the latest being in 1995, which was the last year she performed the iconic role — racking up a lifetime total of 4,500 performances. After the role was offered to and refused by Ethel Merman and Mary Martin (Merman subsequently played the role), Herman re-shaped the show to fit Carol Channing’s particular voice, comic genius and multi-faceted talent. I was also fortunate to have seen the all-black production in 1967, which starred a wonderful (and vastly different) Pearl Bailey. A lot of heavy-hitters and theater divas have assumed the mantle of Dolly Gallagher Levi, the inveterate meddler and matchmaker (the musical, with book by Michael Stewart, was based on the Thornton Wilder play called “The Matchmaker”). In the original run and subsequent revivals, the larger-than-life character was played by Ginger Rogers, Betty Grable, Phyllis Diller, Bette Midler and Bernadette Peters, among others. Which brings us to 2019, and the touring production that arrived on the very day that Carol Channing died, 16 days shy of her 98th birthday. And in that daunting shadow, along comes the also-legendary Betty Buckley, with her long list of Broadway, TV and film credits, her Tony Award for “Cats,” and judging from the audience response to her entrance and curtain call, her adulation by tons of adoring fans. 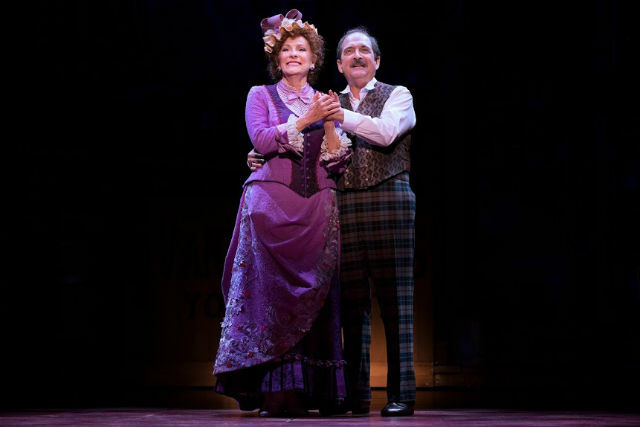 At age 71, she retains a charming stage presence, and a nice way with poignant dramatic moments. She can belt when she has to, though she doesn’t do so often here. She’s not a vocal powerhouse, and she doesn’t have the gigantic personality the role requires. She seemed to be having trouble with breath control, and uncomfortable in the role, though she’s been on tour since October. Her moves were clunky; she’s clearly not a dancer. She has good timing, but she doesn’t seem to be a natural comic. The widowed, indomitable Dolly can be grating and intrusive, and she’s an irresistible force of nature. Buckley’s Dolly is more contained and just plain likable. However, this is such a powerful, compelling production, it supersedes any weakness at the center. The enormous cast of 32 is under the expert direction of Jerry Zaks, and terrific choreography of Warren Carlyle, who pay considerable homage to the original direction and choreography of Gower Champion, though both definitely put their own spin on the piece. The dancing is superb, and the frequently-changing backdrops and scrims, and gorgeously colorful costumes (both designed by Santo Loquasto) are an eye-popping visual delight. Lewis J. Stadlen, who’s a master of broad comedy (he was last seen here on tour starring in “The Producers”), brings some of that same over-the-top energy to that “well-known half a millionaire” Horace Vandergelder, who’s often played a lot more stodgy and irascible. But Stadlen’s portrayal brings extra humor to the show, and to his interactions and frustrations with Dolly (who has her eyes firmly trained on him as a potential remarriage mate). As the young lovers, Nic Rouleau is appealing as Cornelius Hackl, and as his assistant, Barnaby, also working for Vandergelder, Jess LeProtto not only has comic chops and moves, but his stellar dancing ability is used to maximum effect. Kristen Hahn is cute as Minnie Fay and as her boss, milliner Irene Molloy, Analisa Leaming offers a notably alluring presence and voice. This production delights in many ways. It’s a deliciously good old-fashioned Broadway musical, in all the best senses of the term. The remaining performances are Saturday at 2 p.m. and 8 p.m. and Sunday at 1 p.m. and 6:30 p.m.